Russian tea time tradition is exotic and different. Read on to learn more about zavarka and samovars. Foreigners might think that vodka is the national beverage of Russia, but in fact that honor goes to tea. Due the icy climate, Russians drink hot tea throughout the day as a source of both nourishment and warmth. Like other European cultures, Russian tradition also includes an “afternoon tea” served in the late afternoon with sweets and snacks. However, Russian tea time traditions are very different from tea traditions in the rest of Europe. Geographically and culturally, Russia straddles Europe and Asia, and their tea time customs reflect both influences. In many other countries, tea is made by steeping tea leaves in hot water until they have reached the desired strength. However, in Russia, more tea leaves are steeped in less water to create a very concentrated brew called zavarka, boiled for at least five minutes or possibly all day. This brew is then diluted with hot water when it is served. Russians also enjoy mixing different types of tea - for example, black tea with herbal tea. Russian tea is strong, and is almost always flavored with lemon or poured over lemon slices studded with cloves. For sweeteners, Russians use sugar, honey, or jam. Instead of dissolving sugar into the tea, some Russian tea drinkers prefer to hold a sugar cube in their mouths as they drink-a recipe for tooth decay, but an interesting idea nonetheless. One of the most interesting elements of Russian tea tradition is the equipment. To heat the water, a special device called a samovar was traditionally used. The samovar was an ingenious device that illustrates the Asian influence in Russian culture. Modeled after similar pieces of equipment used by the Mongols, the samovar consists of a large metal urn with a vertical pipe in the middle. The urn holds the water, and the pipe in the middle holds burning wood or charcoal. The fuel in the center heats the water to boiling, and then keeps it hot for the rest of the day. Most samovars have a faucet in the middle used to pour water in the cup. The tea pot sits on top of the samovar, kept warm by the hot air moving up from the charcoal below. The samovar is also a thing of beauty. 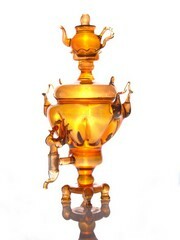 Most samovars are intricately designed pieces adorned with detailed metal-working or even paintings. Traditionally, for those who could afford it, the rest of the tea service was richly decorated as well. For example, Russian tea pots are usually made of porcelain, colored with deep pigments and often with gold accents as well. Since Russians love to mix black and herbal teas, tea pots are made to nest together: the tea pot with the zavarka fits on top of the samovar, and the tea pot for the herbal tea fits on top of that. In some Russian tea sets, the tea cups are made of glass. In order to make the cups safe to carry, metal cup-holders called podstakanniki are used. However, many Russian tea sets use porcelain cups instead. Tea drinking in Russia is an all-day affair, and has been for centuries. A samovar could keep both water and zavarka hot all day long, so that a nice warm cup was always available. 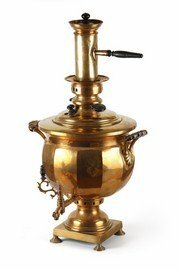 Of course, in the modern era many people have switched to electric samovars, or have stopped using them altogether. Still, even today Russians drink tea after meals and as a between-meal snack. They also still sometimes indulge in afternoon tea. A traditional Russian tea time consists of tea and a variety of sweet snacks, including at least one pie, crepes or pancakes, and jam to go with the pancakes or into the tea. Afternoon teas are rich and nourishing, perfect for bridging the gap between lunch and dinner. Try one if you are ever in Russia, or even just near a good Russian restaurant that serves afternoon tea.